Scaramuccia, also known as Scaramouche or Scaramouch, is a roguish clown character of the Italian commedia dell'arte who wears a black mask and, sometimes, glasses. He entertains the audience by his "grimaces and affected language". Salvator Rosa says that Coviello (like Scaramouche) is "sly, adroit, supple, and conceited". 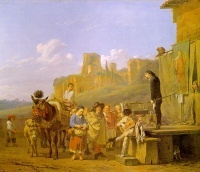 In Molière's The Bourgeois Gentleman, Coviello disguises his master as a Turk and pretends to speak Turkish. Both Scaramouche and Coviello can be clever or stupid—as the actor sees fit to portray him. The name was that of a stock character in 17th-century Italian farce, Scaramuccia (literally "skirmish"), who, attired usually in a black Spanish dress, burlesquing a don, was beaten by Harlequin for his boasting and cowardice. Scaramouche is one of the iconic characters in the Punch and Judy puppet shows (a performative art with roots in commedia dell'arte). In some scenarios, he is the owner of The Dog, another stock character. During performances, Punch frequently strikes Scaramouche, causing his head to come off his shoulders. Because of this, the term scaramouche has become associated with a class of puppets with extendable necks. The hero of Rafael Sabatini's historical novel Scaramouche, and its film adaptations, is a similar swashbuckling character who goes incognito in the theatrical role of Scaramouche. Several films were named Scaramouche, including: "The Scaramouches" (1910), silent movie, by Lewin Fitzhamon; "Scaramouche" (1923), silent movie, by Rex Ingram; "Scaramouche" directed by George Sidney in 1932; Scaramouche (1952), with Stewart Granger and Janet Leigh; among other post films and TV series. Scaramouche is the name of a suite by the French composer Darius Milhaud for saxophone and cabaret orchestra (also in an arrangement for two pianos). Milhaud first composed the piece for theatre. In Tom Stoppard's On the Razzle, Scaramouche is the nom de plume used by sales clerk Weinberl in his letters while answering "lonely hearts advertisements". In the 1975 recording "Bohemian Rhapsody", by the popular British rock band Queen, Scaramouche is asked to do the fandango. Inspired by "Bohemian Rhapsody", Scaramouche is the name of the lead female role in the jukebox musical We Will Rock You. In Arthur Ransome's children's novel Swallowdale (1931) the mother of the Amazon Pirates, Nancy and Peggy, calls them scaramouches in the chapter 'The Race'. Unless indicated otherwise, the text in this article is either based on Wikipedia article "Scaramouche" or another language Wikipedia page thereof used under the terms of the GNU Free Documentation License; or on original research by Jahsonic and friends. See Art and Popular Culture's copyright notice. This page was last modified 17:33, 28 June 2014.